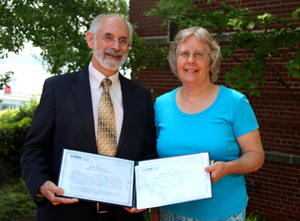 This award is named for Robert Mallory Freeman, a former VIMS Council member and supporter who passed away in 2004. Bob was chairman of Signet Bank in Richmond until 1996. He was active with the Chesapeake Bay Foundation and the Virginia Environmental Endowment, among many other community leadership activities. At VIMS, Bob was interested in oyster restoration, advancing research with cutting-edge scientific equipment, and helping to leverage resources through his many generous donations. This year’s Freeman Award goes to Mrs. Susan Crockett, a Gloucester County resident, for her exceptional efforts to assist with our public outreach and wetland science. Susan came to VIMS last year as a Virginia Master Naturalist seeking volunteer opportunities related to Virginia’s flora and fauna. She has since logged more than 68 volunteer hours in 3 different areas. She assisted with routine maintenance of the VIMS Teaching Marsh gardens, helped aquarium staff prepare custom blends of food for the display animals, and assisted with restoration research in our forested wetland. Susan is a reliable and trustworthy volunteer, as well as just a very nice person. She is able to work independently once given instructions and is always willing to do whatever tasks are needed, no matter how mundane or new. VIMS staff greatly enjoyed working alongside someone who can solve problems so effectively. Thanks to Susan’s volunteer efforts, work is accomplished that otherwise would not get done as well or as often. The Teaching Marsh gardens look nice all summer long and the aquarium staff says she leaves happy fish in her wake. She is truly deserving of the Robert M. Freeman Volunteer of the Year Award.